What an enjoyable day and so far a great evening as well! We bought a garden box for our deck so I can start a fun little garden on our oversized, awesome deck. Yeah yeah, I know it is August, but hey I can still do fall vegetables. Although, so far I only have kale and 4 herbs out there. Next plan: build our own box and get some fall veggies planted. So much fun! Plus it inspires me even more to cook all day. So yeah....I have been cooking all day. I call these crazed episodes my "freak mode". I can't sit down and just continue to cook. I don't think Ryan complains when these "episodes" occur. His tummy is most certainly satisfied. Technically speaking, this recipe is quite simple. You really are not doing much cooking and there is little prep. Just mixing your fillings and salsa together and throw it in the oven! Note that you do have to make the squash first, so that does take some time. You can choose whether or not to include vegan "cheese". I thought it was a nice addition. The avocado "crema" is also a really nice creamy addition as well! Preheat oven 400. Place halved and seeded squash in a baking dish and lightly brush with evoo. Bake for 25 minutes. In the meantime, make your filling. Simply toss all the remaining ingredients except for the vegan cheese. Once done baking, remove squash from oven and let cool for 10 minutes before cutting into cubes. Leave oven on! To cut the squash, cut a grid like pattern of cubes in each squash. Remove the cubes with a spoon and add to your corn/black bean filling. Stuff each squash with the filling, top with vegan cheese and bake for another 10 minutes or until "cheese" is melted. Directions for the vegan avocado "crema"
Just throw all the ingredients in a blender until smooth. Adjust seasoning accordingly. Fragrant, a bit sweet, a bit spicy, and a bit salty. This dish covers a spectrum of flavors, without overwhelming your palate. And the dish really comes together when you add in your ras el hannout. Yeah yeah, I know what you are thinking. Ras a what??? That was a mouthful of gibberish! So, I'll make things easier for you and call it your Moroccan spice mix or just Moroccan spice. From Northern Africa, it is an Arabic and means "head of shop", basically saying that this is a mixture of the best spices. This is a great stew to make if you have an abundance of produce and want to use a lot of it. I love the variety of tastes and textures due to the mixture of dried fruits, vegetable and olives. Of course, I always like to choose a low(er) carb option if it is available. I had so much cauliflower in my refrigerator and new I wanted to make this into a couscous. It is seriously so easy! You simply throw it in your food processor, grate it, then season and saute. Bam! This really has the texture of couscous! You can also use grated cauliflower to emulate rice as well in a raw dish, or in a fun summer squash risotto. But please keep in mind, while this is significantly lower in carbohydrates when comparing to rice, I would not consider this being "low carb", hence saying low(er) carb option. A serving a white rice is roughly 45 g of carbs, whereas a serving of cauliflower is 29. FYI- If you are on a low carb diet, you want anywhere between 50-75 g of carbs a day. Just some food for thought for all you healthy people out there that are interested in a low carb diet. With your blender or food processor, add in can of diced tomatoes with liquid and blend until smooth. Set aside. After you have prepped all of your produce (there was definitely a good amount of prep and chopping), heat evoo in a large stock pot and saute ginger and garlic for roughly 2 minutes. Add in sweet potatoes, carrots, celery, onion and saute for about 5-7 minutes, mixing frequently. Add in the zucchini, apricots, green olives, and your Moroccan spice mix. Add in more evoo if necessary, and saute for another minute or so. You want to release some of the fragrance from the spice mix. Add in the veggie broth and purred diced tomato mixture. Bring to boil, cover and turn to low. Simmer for roughly 45 minutes, or until the vegetables are soft. Add in more spice mix to taste and salt to taste. In the meantime, start your "couscous". Place cauliflower in a food processor and grate the couscous into a fine "kernel" by pulsing it until there are no large pieces. Heat evoo in a saute pan, add in grated cauliflower, season with s+p and saute for about minutes or until soft. Note; you do not want it mushy! Once your stew is done, add more seasoning to taste. Spoon into a bowl and serve with cauliflower couscous. I am starting to go a little stir crazy not being able to work. One month turned into practically the entire summer sans massaging. Sure I miss making money, but I sincerely miss working on my clients and helping their body and minds. Hopefully just a few more weeks of physically therapy and I will be in tip top shape. Luckily, cooking and this wonderful blog (wink wink) keeps me busy. As I have said before, I am a pretty tense and wound up person. Cooking is my therapy. It calms both my mind and body. I made this delicate, slightly sweet soup on a cool summer night. But I think it would also be perfect for an autumn meal as well. If you want to make this soup a bit more hearty, simply add in a peeled and cubed potato and saute along with the fennel, leeks and apples. Though, the reason why I love this soup is because it is low carb and extremely tasty. I love topping this soup off with a tasty balsamic reduction and a bright and crunchy apple and walnut salad. The contrast in textures and tastes really mesh together! Preheat oven 350. In a bowl, toss the chopped fennel bulb, leeks, and apple with evoo until they are evenly coated. Place on baking sheet and roast bake for roughly 30-45 minutes, stirring every 15 minutes. Once they are done roasting. Take out of oven and set aside. In a large pot, heat evoo on med-high and saute ginger, garlic and thyme for roughly 3 minutes, stirring frequently. Add in the baked fennel, leeks and apples and saute for another 2-3 minutes. Add in vegetable broth, lemon juice and turmeric. Salt and pepper to taste. Bring to boil, cover and simmer for 15-20 minutes. Once simmered, transfer to your preferred blender (I love my Ninja) and puree until smooth. Transfer back to pot, return to your desired temp. When ready to serve, ladle soup into a bowl, top with small pieces of apples and walnuts, drizzle on balsamic reduction and dust with frond. Summer Vegan Cranberry Bean Salad! I saw these gorgeous red, marbled beans across the produce section of our new local produce store, and was immediately drawn to them. I have never seen these beans before and new I had to buy them. I actually had no idea what I was going to do with them, but that should never stop someone from being curious and creative. As pretty as the shells look, you do not eat them. So, you do have to do some shelling here. The beans themselves are quite unique as well. Speckled almost that of a quail egg, where some are white with red speckles and others vice-versa. Cranberry beans are no joke either! One cup of these are less than 250 calories, almost 18 g of fiber and almost 17 g of protein. I am sure a hearty soup would be great using the beans. To me, they are similar to northern beans or kidney beans. But, since it is summer, I wanted to go with a bright, tasty bean salad. Great for picnics and parties! Add your vegetable broth or water and shelled cranberry beans to a boil. Cover and simmer for roughly 35-45 minutes or until soft. In the meantime, another boil another pot of water and steam your green beans. I like my green beans slightly crunchy and a vibrant green color, so I usually steam them for just a few minutes. Once your cranberry beans are done, toss all your vegetables in a bowl. Whisk together your dressing ingredients and add to the bowl. Viola! A new fun and easy bean salad! Obviously soups are not so popular in the summertime, unless they are some variant as a gazpacho, but unfortunately it has been unseasonably chilly this summer....Especially today! I just came back from a 45 minute walk, wearing a sweatshirt and yoga paints. I even had an earache from the chilly winds. It is mid August, correct? Bring on the 95 degree days dammit! I wasn't sure how this soup was going to turn out, because aside from the recent "ricotta" stuffed squash blossoms, I have not played around with this flower much. But, it was lovely. It was delicate, super light, smooth and had a wonderful tang to it. Ryan mentioned that is reminded of him of the taste of a posole. I don't think I really agree with that, but to each their own. If you have corn on hand, you may want to add that as well. Unfortunately I did not have any laying around, but I would imagine that it would be a nice addition. Heat evoo in a large pot on med-high. Add in garlic, carrots, onions and peppers and saute until onions are translucent and carrots are soft, about 5-7 minutes. Stir frequently. Stir in broth and almond milk, then add in the seasonings and squash blossoms. Add more seasoning according to your palate. Bring to boil, then cover, turn to low and simmer for about 15-20 minutes to combine the flavors. With a hand held blend or a food processor, blend your soup. Try not to blend it 100 percent. I like having it about 75% smooth. Add in your lime juice and stir. Bam! Your tangy soup in finito! You can enjoy this warm and room temp! Who doesn't like a fresh, healthy, hand held wrap? Especially when the hand held item is made with a vibrant leafy green! I love using collards as the wrap because of the consistency of it. Once you blanch the greens, the bitterness of the collard is muted and they become pretty maliable. A perfect vessel to whatever you want to put inside your yummy wrap! Clearly you can fill your wrap with whatever is screaming out at you in your plantry. But, I chose to go an Asian route. I chose to marinate some tofu in teriyaki sauce and make a miso-cashew cheese. And of course, this is optional but also made a gochujang spiked mayo. If you have not heard of gochujang, it is a Korean hot pepper paste that is fermented. It is made of chilis, fermented soy beans and glutenous rice powder. Unlike other chili pastes, this one is slightly spicy and a bit sweet. In a bowl, add in the teriyaki sauce and marinate the tofu. Set aside. You are going to want to start with blanching the collards. Bring a pot of water to a boil. While waiting for it to boil, set up a bowl with ice and cold water. Once boiling, toss in the leaves for just about 30-45 seconds. Immediately remove from boiling water and toss into the ice bath. Once the leaves have cooled off, transfer to a plate, pat off water with paper towel and set aside. Now, take your soaked cashews, drain and transfer to a cuisinart. Add in the remaining ingredients for the cashew cheese, and blend until smooth. Add in water if the consistency is too thick. Now arrange your wrap, spoon in about a tbsp of the cashew cheese in the center of the collard leaf, and smooth. add in your vegetables and tofu and roll. Repeat until all your wraps are complete. Mix together the chili paste and mayo in a bowl and serve on the side. Enjoy your hand held wrap! Vegan "Ricotta" Stuffed Squash Blossoms! I am still getting used to my new kitchen. It is hard to be efficient when you don't know where everything is! But I am beginning to feel more comfortable and at home here. And....this is the first time using this oven, so hopefully it works! I have been wanting to cook with squash blossoms since I saw them at my local produce store last summer. Now that they are back in season, it is time to get down with these edible flowers! So what are squash blossoms and what do they taste like? Good question! They are dainty, bright orange flowers of a pumpkin, squash or zucchini that are tender, with a slightly sweet and savory component. Eaten raw, they almost melt upon your tongue like a gentle snow flake. When dealing with this recipe, a heavy hand is ill advised. The blossoms are extremely delicate..... So delicate that I actually used a syringe to insert the "ricotta" filling. Now, don't fret if you don't have a syringe laying around. Lets be honest, I am sure most households don't have them. But, if you are into stuffing small items, they certainly do come into good use. Alternatively, you can use a small spoon and carefully stuff them. What I really love about this appetizer is the contrast between the crunchy outer of the panko crumb mixture and the creaminess of the tofu "ricotta" filling. If you have left over "ricotta", save it and make some fabulous eggplant rollatini in the next few days! Once you have washed your squash blossoms, carefully separate each one and gently pat dry with paper towels. Set the blossoms aside. With a food processor, add in all the "ricotta" ingredients and gently pulse until everything is combined. You do not want to fully turn it on because you do not want the mixture to be completely smooth. Now the fun part, either with a small spoon or a syringe, carefully stuff the blossoms with roughly one tablespoon of the "ricotta". Once this is done, set up your breading station. In one bowl, mix together the egg replacer with water and in the other, combine all the breading ingredients. Coat each blossom with egg replacer, then drench in the panko mixture. Bake in oven for about 15 minutes. Let cool for about 5 minutes and enjoy with tomato sauce! Summer summer summer time = break out the grill, homies! Brand new apartment and a huge deck means we finally get to buy our own very grill. We even have a separate dining room, which is also very exciting. I foresee dinner parties in the near future. Yay! Now this is exciting people! The raspberry-kale quinoa salad would be perfect for a picnic or any sort of get together this summer. It is light and packed with protein. And, who wouldn't love the sweetness of the raspberries? 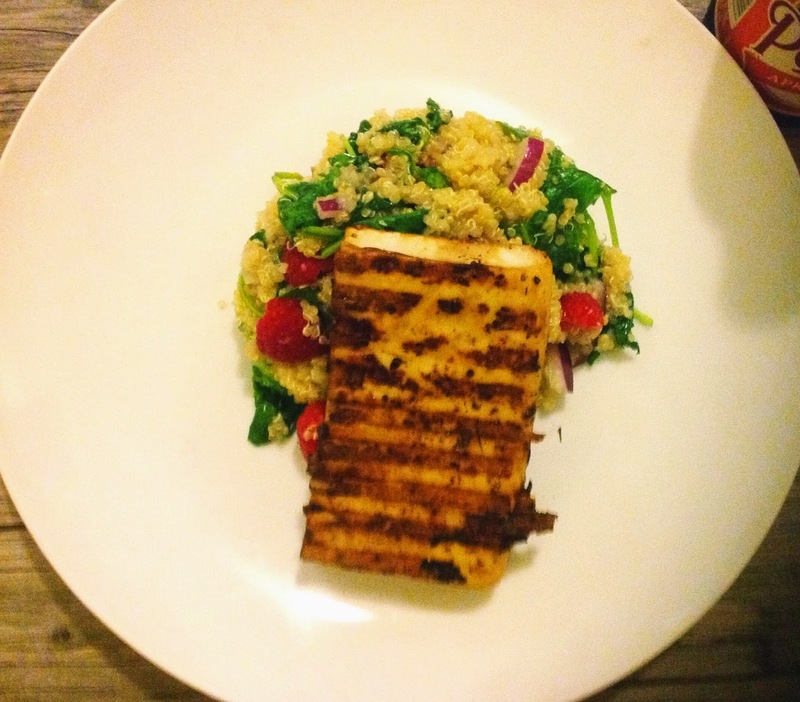 Add the blackened tofu, and this meal is blasted with protein! With the combination, there are 34 grams of protein for one serving! Lean, mean vegan machine right here! Once you slice your tofu, press your tofu with paper towels and remove water. Set aside. In a small bowl, whisk together the oil and tamari. In a separate bowl, combine all the seasonings. Brush on the wet ingredients, smothering the tofu, then place the tofu in the seasoning mix, coating each side. Grill each side of the tofu for about 1-2 minutes and serve immediately. In a pot, add in the quinoa and broth and bring to a boil. Cover, turn to low and simmer for about 15-20 minutes. Once done, transfer to a bowl, fluff and add in the remaining ingredients. Season to taste. Allow the salad to cool for about 15 minutes in the refrigerator or serve warm. Enjoy! It was a sad and lonely month. Not to mention having to eat out often met not so healthy choices all the time. But not we are all moved in, the kitchen and plantry is looking great, so lets start whipping up some lovely, healthy vegan food! I love zucchini noodles, especially in the summer. They are light and perfect with a hand crushed raw tomato sauce with garlic and olives. Vibrant, healthy, quick and easy! With a spiralizer or a mandolin, slice the zucchini into noodles. Throw the noodles in a bowl add in a bit of salt. Adding the salt with extract water from the zucchini, in turn making them soft. Set aside. In another bowl, crush the tomatoes with your hands, releasing the juice from the tomato, then roughly chop up the tomatoes. Add in evoo, the minced garlic and olives and season to taste. With a paper towel, light squeeze the noodles to eliminate the water and toss with your fresh tomato sauce. That's it kiddies! Enjoy!